Westdale Home and Flats (respectively) are situated at 129/127 Melton Road (A606), West Bridgford, Nottingham, NG2 6FG. If travelling from Nottingham it is past the Musters Road/Melton Road junction (traffic lights) and a few hundred yards past the shops on the left hand side before reaching the hill. If approaching from the Wheatcroft Island (A606/A52) end of Melton Road it is to be found after the second set of traffic lights at the bottom of the hill on the right hand side before the 30 mph road speed signs and before reaching the shops. The No 5 Nottingham/Keyworth bus stops close to the home. 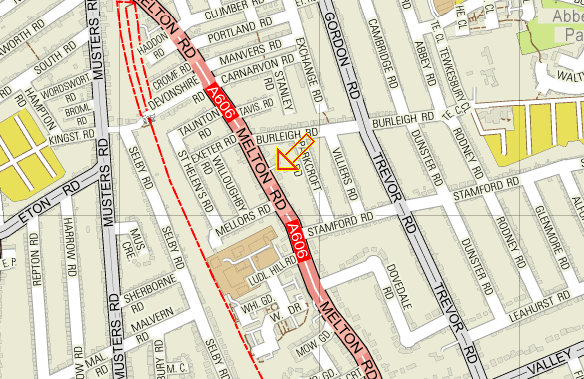 Click to see a zoomable streetmap on a new page – afterwards use the browser back button to return to our web site. Still can’t find what your looking for? Send us a message using the form below and we will get back to you!